Memorial Day in Israel is an unusual experience. As one who has studied modern Israeli history, I’m fully aware of the human cost that has been absorbed by this small nation in her effort to survive in this neighborhood. And the traditional observance here, seems to keep that cost in the forefront of the minds of Israel’s citizens. Since the first moments of her existence she has been in a battle for survival. Actually, that battle for survival started well before David Ben Gurion announced the independent statehood of the modern state of Israel on May 14, 1948. Since that monumental announcement, Israel has been engaged against her enemies with a formal war in each decade: 1948, War of Independence; 1956, The Sinai Campaign; 1967, The Six Day War; 1973, The Day of Atonement War; 1982 The [First] Lebanon War; 1990, The [First] Gulf War*; and 2006, The [Second] Lebanon War. Though objective “experts” generally suggest that Israel was the victor in all these wars, except perhaps the 2006 Lebanon War, the cost in human life has been heavy. And Memorial Day is dedicated to the memory of those who gave their lives in military service to this country. It is observed differently, and I think more personally in Israel, than I have noticed in the United States. All across the nation, during Memorial Day, the air raid sirens will sound twice in an unbroken, somber wail: One minute at 8:00 in the evening and then for two minutes the next morning at 11:00. ** Everything comes to a halt when the siren begins. 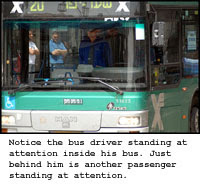 Cars stop (even on the highway) and the occupants generally get out and stand at attention. Those on the streets, stop in their tracks and stand at attention. It is actually quite moving to see this in action. In addition to the observance of a moment of personal silence during the sirens, throughout the day, there are memorial services in every community, as well as at every military cemetery. Places of entertainment are also closed and the radio stations play reflective, nationalistic songs, which help keep the public’s thoughts sober and contemplative, and perhaps appreciative of the sacrifice of so many. Another important way that Memorial Day is different in Israel than in the United States is that it is directly connected to Independence Day, which is the next day. So, as Memorial Day closes out at sunset, Independence Day, opens in all its splendor. It’s as if the calendar testifies, “without sacrifice, there is no celebration.” I like this better than the month long separation between the two days in the American calendar. *At the request of President George H.W. Bush, Israel didn’t actively participate in the 1990 Gulf War, though they did receive “retaliatory” scud missiles from Iraq. ** The Jewish day starts in the evening, the the first sound at 20:00 and the second at 11:00.